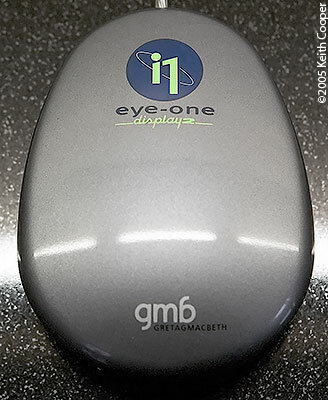 The Eye One Display 2 device from GretagMacbeth (GMB, who make a wide range of colour management hardware and software) is a small device to enable you to accurately and quickly calibrate and profile CRT monitors and LCDs (including laptops). 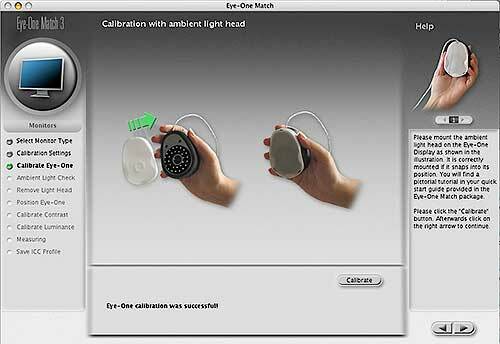 Keith looks at the calibrator and the Eye One Match software (V3.2a) supplied with it. 2012 Latest – X-Rite took over GMB a few years ago and you can still find the i1Display 2 on sale. However, the software has not been updated for a while. The current equivalent products are the i1Display Pro and the more basic ColorMunki Display, both of which are fully reviewed on this site. The sensor is also available in the Pantone Eye One Display 2 package. We have an update/addition to this review showing how the device fits in a new range of colour management solutions under the Pantone brand. 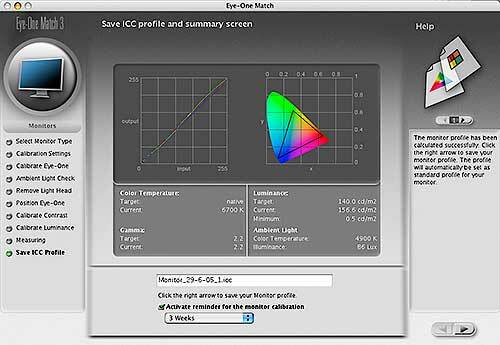 In case you are wondering just what this ‘Colour management’ stuff is, we’ve a very short guide to colour management page that might be of help. 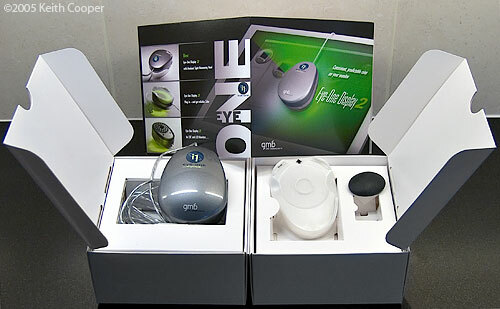 The Eye One Display 2 device comes in a neat reusable box. It includes an ambient light measurement attachment (the white plate) and a counterweight (black oval) for use with LCD displays, where the suction cups on the measuring device could damage the display. It is a USB device and the software works fine on both Macs and PCs. The actual device is smaller than the photo above (about 8cm or 3 inches long). The box is actually a marvel of cardboard cutting and folding (who needs polystyrene? ), however, be aware that you need some considerable dexterity to re-assemble it if you pull it apart! I’ve used a Spyder Pro colorimeter for calibrating and profiling monitors for some time and more recently the Eye One spectrophotometer and I’ve been very happy with the results from both. My Eye One spectrophotometer (Eye One Design review) is used for many other things (printer profiling for one) that are far beyond what you would try with a colorimeter. The Eye One Display 2 that I’m looking at here is a colorimeter like the Spyder Pro, but also includes ambient light measurement capabilities. It uses the same Eye One Match software that I use with the spectrophotometer. If you are completely new to colour management I’d suggest you might like to have a look over my Introduction to colour management article on this site before going too much further into this review. However, I have added links to articles and information on this site and others explaining some of the concepts mentioned here. It’s worth remembering that you are actually measuring the whole monitor/display card combination, since some aspects of monitor display can depend on the capabilities of your video card. 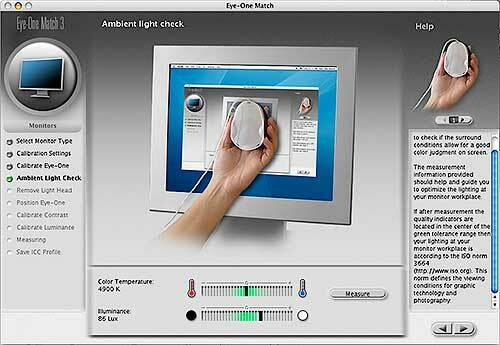 Installing the software (Eye One Match) is a simple operation — Functions not appropriate to the Eye One Display 2 sensor are greyed out. Here, I’ve selected monitor profiling. You can pick an easy ‘set it all up for me mode’ or a more advanced set of options giving control over many more calibration parameters. There is a useful help panel on the right hand side available throughout the process. Next I select my chosen white point, gamma and luminance. I’ve chosen Native for this LCD since I’m not looking to use it for critical colour matching and want to maintain the best overall performance. There are recommended settings for different types of displays and their uses in the help panel. I’ve chosen ambient light measurement as an option. When you check the ambient lighting in Eye One Match you need to calibrate the sensor for ambient lighting using the white plastic ambient light head. You can then make measurements of light levels. The bar graphs give an indication of colour temperature and intensity. The Eye One Display device is attached to the screen by its little suction cups for CRTs and just rested against it for LCDs (the counterweight is attached to the cable to balance it) It helps with LCDs (and Laptops) if you tilt the screen back slightly so that the sensor rests cleanly on the display. In advanced mode you get to set display brightness and contrast (with the sensor attached) Adjustments are made to monitor settings to get close to your chosen settings. 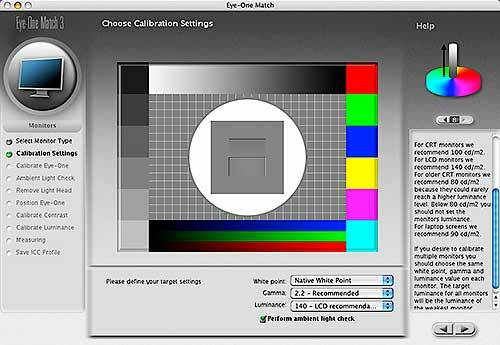 The calibration and profiling process then takes a few minutes, so be careful to disable any screen saver that might cut in and ruin the calibration process. The screen should have been on for a while (at least 20 minutes) to stabilise. If you want to see just how much difference there is, profile your screen after 10 minutes use, and then an hour later. Our eyes are so good at compensating for colour drifts and variation that you will probably be quite surprised at the change. At the end, you get a graphical representation of the LCD response curve and an indication of Gamut. 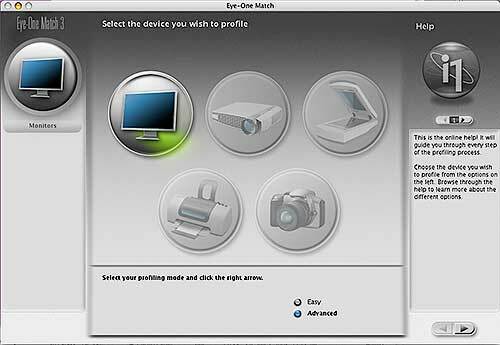 The profile is calculated and you can save it and make it the default monitor profile. I also compared the ambient light measurement from an Eye one Display 2 to that from an Eye One spectrophotometer. The measurement shows a very low colour temperature at 88 Lux. This was an energy saving light bulb in my hallway. The Eye One result shows the very spiky spectrum that such lamps produce. Data from using Eye One Share with an Eye One Spectro – see the Eye One Design review for my opinions on this free software. The monitor profiling is very easy to set up and use. The help facilities mean that you won’t need to get the manual out every few weeks to profile your monitors. The ambient light measurement is a useful adjunct, although you will need to understand a bit more about workspace set-up and lighting if you are to make the most of it. 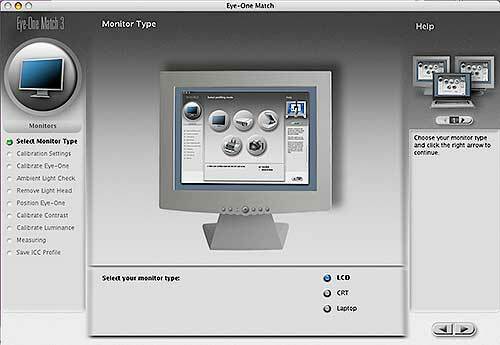 Several monitor profiles I created were indistinguishable from ones created shortly before with the Eye One spectrophotometer. If you are on a tight budget you can still (Jul 05) get hold of the old Eye One Display device, the new device is said to produce noticeably better profiles, but I’ve seen the old units for as low as $70. Might be just the thing if you are looking to move up from doing your calibration by eye? I should imagine that stocks won’t be around for long though.